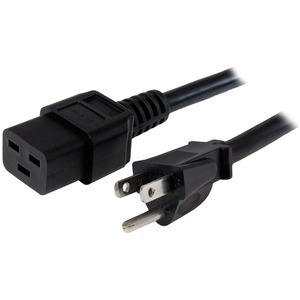 This NEMA 5-15P-to-C19 power cord features 14 AWG wire that's suitable for high-power connections, making it perfect for high-end server equipment such as routers, switches, Power Distribution Units (PDU), etc. Plus, you can use the cable to extend the reach of your existing power cord by 3 feet, which gives you the extra distance you need to place your devices according to your server room configuration. Expertly designed and constructed of high-quality materials, the StarTech.com PXT515C19143 power cord is backed by a lifetime warranty.